Set in Chicago, The Upstairs Concierge follows Ella Elizondo (played by Tawny Newsome) on her first day of work at The Hotelman Arms, a boutique hotel owned by Jeffrey and Dia Hotelman (Cedric Young and Annie Henk). Taking self-sacrifice to new heights, the desperate-to-please Ella has signed on to be the “Upstairs Concierge;” a position that requires her to spend every waking—and sleeping—moment serving her celebrity guests. With a rag tag staff that including two bellhops, Harvey (Gabe Ruiz) and Kaz (John Stokvis), it becomes hard to keep track of which guests are in which room, which guest is the biggest celebrity and party-loving guests need extra supervision. Get connected! 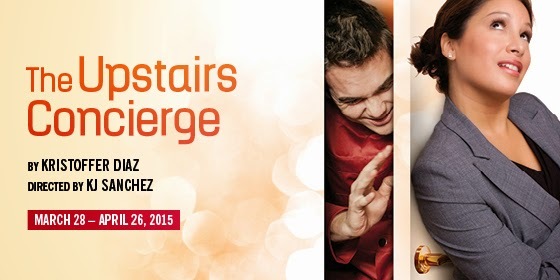 Follow @GoodmanTheatre and #TheUpstairsConcierge for behind-the-scenes content and more. The Upstairs Concierge is a classic farce with modern themes by Obie Award winner and Pulitzer Prize finalist Kristoffer Diaz, the “vibrant young playwright” (The New York Times) with a “talented new voice” (The Los Angeles Times). A co-commission with Teatro Vista, The Upstairs Concierge was developed over three years through a series of improvisational workshops and a developmental production in the Goodman’s 2013 New Stages Festival. Director KJ Sanchez, in her Goodman directorial debut, brings together the all-Chicago ensemble cast, including Theo Allyn as Mark Merriman; Sandra Delgado as Shivery Delicious; Alejandra Escalante as Rebecca Oaxaca; José Antonio Garcia as BB; Annie Henk as Dia Hotelman; Tawny Newsome in the title role as Ella Elizondo; Gabriel Ruiz as Harvey; John Stokvis as Kaz; Travis Turner as Royals Guy; and Cedric Young as Jeffrey Hotelman. The Upstairs Concierge runs March 28 – April 26 in the Owen Theatre (opening night is Monday, April 6). Tickets ($10-$40; subject to change) are on sale now and can be purchased at GoodmanTheatre.org, by phone at 312.443.3800 or at the box office (170 North Dearborn). Edelman is the Major Corporate Sponsor for the Owen Theatre Season. Blue Cross Blue Shield of Illinois is the Corporate Sponsor Partner. The Joyce Foundation is the Principal Support of Artistic Development and Diversity Initiatives. A special grant from the Time Warner Foundation enables Diaz to pen several scripts to accompany The Upstairs Concierge, produced into short films by Cap Gun Collective, a Chicago-based film company. Featuring cast members Newsome, Ruiz and Stokvis, the films function as both stand-alone comedic shorts as well as an invitation for audiences to delve deeper into the world of the play and the imaginations of the creative team and cast. Overall, Goodman Theatre’s New Work Initiatives are supported by The Davee Foundation, The Time Warner Foundation, The Elizabeth F. Cheney Foundation, The Pritzker Pucker Family Foundation, The Glasser and Rosenthal Family, the Harold and Mimi Steinberg Charitable Trust, and The Joyce Foundation. The Goodman also partners with Kimpton Hotels’ concierges—Sheila Garg, Chief Concierge at Hotel Monaco Chicago and Bobby Gonzalez, Concierge at Hotel Palomar Chicago—to serve as “concierge consultants” on the production, working with Newsome to inform her character. Set in Chicago, The Upstairs Concierge follows Ella Elizondo (played by Newsome, who collaborated with Diaz on the production since the beginning) on her first day of work at The Hotelman Arms, a boutique hotel owned by Jeffrey and Dia Hotelman (Young and Henk). Taking self-sacrifice to new heights, the desperate-to-please Ella has signed on to be the “Upstairs Concierge;” a position that requires her to spend every waking—and sleeping—moment serving her celebrity guests. With a rag tag staff that including two bellhops, Harvey (Ruiz) and Kaz (Stokvis), it becomes hard to keep track of which guests are in which room, which guest is the biggest celebrity and party-loving guests need extra supervision. The creative team includes Todd Rosenthal (set designer), Rachel Healy (costume designer), Marcus Doshi (lighting designer) and Mikhail Fiksel (sound designer). Kimberly Osgood is the production stage manager and Tanya Palmer is the production dramaturg. Kristoffer Diaz returns to the Goodman, where his play The Upstairs Concierge ran during the 2013 New Stages Festival. Diaz’s full-length plays include The Elaborate Entrance of Chad Deity (2011 New York Times Outstanding Playwright recipient, Pulitzer Prize finalist, Lucille Lortel Award, Obie Award, Drama Desk nominee and Jeff Award winner for Best Production and Best New Work), Welcome to Arroyo’s and #therevolution, among others. He is a playwright-in-residence at Teatro Vista, as well as a recipient of the Jerome Fellowship, the Future Aesthetics Artist Regrant and the Van Lier Fellowship (New Dramatists). Diaz is also a former member of the Ars Nova Play Group and is currently working on commissions for the Goodman/Teatro Vista and the Oregon Shakespeare Festival. KJ Sanchez is making her Goodman Theatre directorial debut. Other Goodman credits include Thyona in Charles L. Mee’s Big Love. Her directing credits include ReEntry (Urban Stages, co-creator); Private Lives and Mere Mortals (Two River Theater Company); The Diary of Anne Frank and Noises Off (Milwaukee Repertory Theater) and Water by the Spoonful (Studio Theatre). She is an artistic associate at Cincinnati Playhouse, where she directed Venus in Fur, Seven Spots on the Sun and Joan, the Girl of Arc. Sanchez has also directed at Baltimore’s CENTERSTAGE, Round House Theatre and Actors Theatre of Louisville, as well as over 30 military bases throughout the country and abroad. She is founder/ CEO of American Records and provides the voice of many characters in the cartoons Dora the Explorer and Go, Diego, Go! Tickets: www.GoodmanTheatre.org/Upstairs or 312.443.3800 (telephone); 312.443.3825 (fax); 312.443.3829 (TTY/TDD). Box Office Hours are 12noon - 5pm; on performance days, the office remains open until 30 minutes past curtain.